A mere short trip away from Hangzhou and Shanghai you will find Yiwu, the world’s largest wholesale market. Yiwu is like many cities all over China that in the span of a few decades transformed from a small town into a full-blown metropolis. Backed by light industry, the city has promoted the development of its commodities market, which in 2009 alone brought in US$ 8.3 billion according to local administration. Its success is quite remarkable given the size of the city, but can it withstand the increasing competition from abroad? Yiwu is an inland city too far from the sea to make it a valuable port city like Shanghai or Hong Kong and it is located in an area unsuitable for agriculture and poor in natural resources. It has achieved its success solely by promoting trade both nationally and internationally. Its relative proximity to Hangzhou and Shanghai does grant it some advantage in terms of transport and logistics. 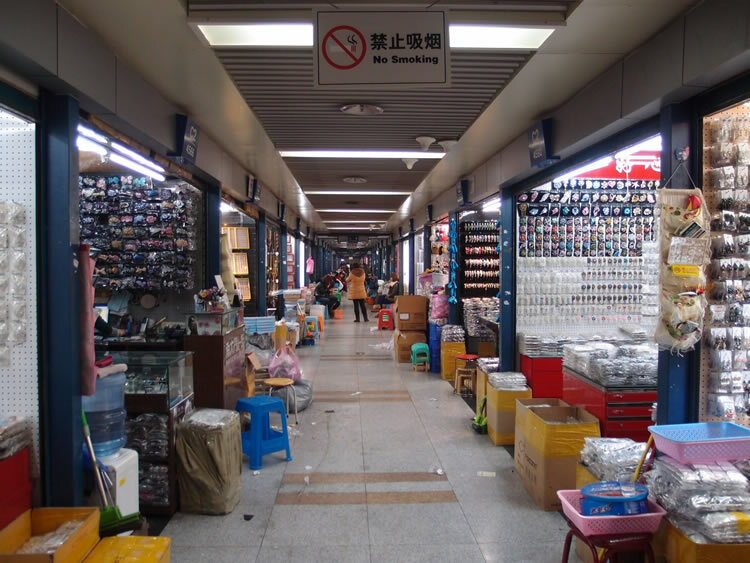 The growth of Yiwu market took off in the late ‘70s when local merchants started expanding their business networks with more industrialized cities. The famed Chinese guanxi (interpersonal networks) were particularly strong in Yiwu, where merchants followed a long established tradition of sharing information. The exchange of information was to be the driving force behind the city’s development, even as it lacked industrial support. Yiwu is one of those Chinese cities that exemplify the success of the reforms President Deng Xiao Ping started in 1978. The dual price system then established allowed citizens and businesses to trade with some level of freedom, a radical reform at the time, and price flexibility led to the development of the local tertiary industry. The decentralization of state control also conferred more freedom to individual counties and, in 1982, Yiwu’s local government allowed China’s first free market to take place in the city. From then on, economic reforms gradually decreased controls on private businesses which flourished at the expense of state owned firms. Today, Yiwu has grown from an open and bazaar-like market into an industrial cluster and national economic force to be reckoned with. It has continuously won national awards for development and administration and has been named the largest small commodities market in a 2005 joint report by the World Bank, the United Nations and Morgan Stanley. The heavy and high technology industries in China are largely dominated by cities such as Shanghai, Suzhou, Shenzhen and Beijing. Yiwu, however, specializes in the production and trading of small commodities. From key rings and toys to cosmetics and jewelry, in excess of 300,000 different products can be found within the markets. These days, Yiwu is a major trade destination for trade: with the capacity to hold 70 thousand stalls, the Yiwu International Trade Center advertises products covering 40 industries and more than 2,000 categories, attracting over 200,000 visitors a day. The city also hosts China’s third largest exposition -the International Commodities Fair- that is so popular that competition for stall space requires exhibitors to reserve a year in advance. Though a major percentage of the city’s exports head off to the United States; Yiwu-traded products are sold in virtually every country in the world. French supermarket chain has ordered clothing in view of the World Cup in Brazil, and a Dubai businessman placed an order for Hamas scarves. The Yiwu tourism website boasts the city engages in business with over 200 countries. Local officials have claimed, perhaps surprisingly, emerging markets in Africa and the Middle East were the largest export destinations. Until recently, Iran and the United Arab Emirates were at the top of the export list with the United States. There have been doubts, in spite of Yiwu’s incredible success, about its future. The conditions that led to its astounding growth are slowly eroding. Renminbi appreciation will decrease China’s net exports and rising overheads will cause buyers in the commodity market to seek out alternatives in neighboring countries. The politically stable Vietnam, for instance, provides unskilled workers for almost a third of the costs. Despite its infrastructure problems, the country offers a viable alternative to China’s increasingly expensive workforce. However, it’s not an attractive alternative for all companies. The lower costs in neighboring countries do not necessarily outweigh the drawbacks. China’s energy grid and transport infrastructure are much more appropriate for industrial purposes and high volume product transport. As a result, although the production of small commodities found in markets such as Yiwu will be increasingly moved to more low-cost countries, heavy manufacturing will stay in China for the foreseeable future. Yiwu is the epitome of exhibition-driven trade. Businesses and merchants flock in from all over the world to take advantage of the trade centre the city has become. As China further affirms its status as a global economic and industrial powerhouse, Yiwu will only enhance its prominence as an exhibition and trade centre.